Hillary Chybinski: Writing Your Memoir - Can you do it? Should you? Writing Your Memoir - Can you do it? Should you? Have you ever thought about writing your memoir? Maybe like me, you've felt for a long time that there is a book inside you somewhere. I believe that is what really got me started in Blogging. I've wanted to write a book for as long as I can remember. My problem? What to write about. It's even a stumbling block I face when blogging, there is just SO MUCH in the world, how on earth do I narrow it down? 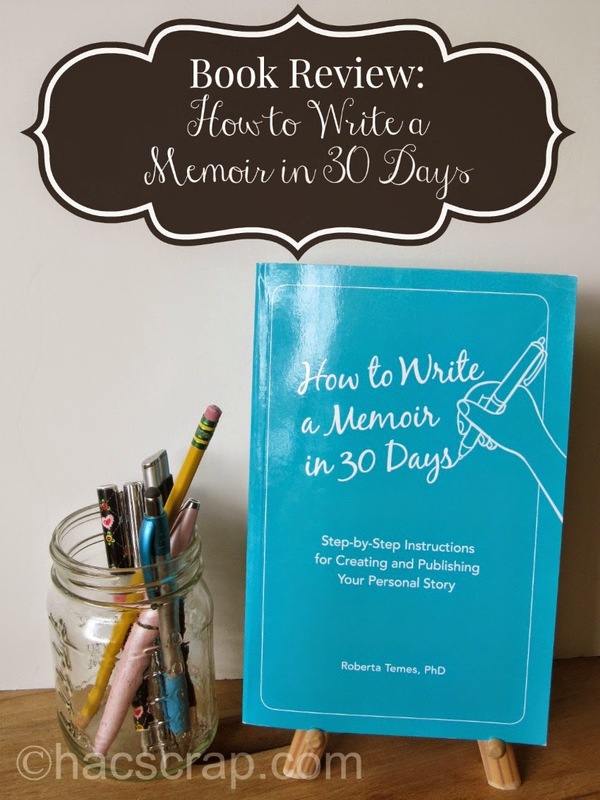 So I was intrigued when presented with the opportunity to review, "How to Write a Memoir in 30 Days" by Dr. Roberta Temes. Here's something I'm not sure I really understood - "A memoir is not an autobiography. An autobiography is strictly factual and chronologically covers your life from birth until today. . . Memoirs are are emotional reminiscences. " The very first thing I loved about this book, is that it is set-up in daily prompts. Hey, I can do daily prompts . . .and that way, if something (like life) gets in the way, you can pick up where you left off and keep going. I recently started trying to develop a daily free-form writing habit. Three pages, every morning of stream of consciousness writing. Some days it's as if the words were waiting for me to wake up to jump onto the page. . .other mornings, it's almost as if my head were completely empty. What if on those empty days, I selected a chapter from the book (my Type-A tendencies force me to go in order from 1 to 30) and used that prompt to write. Some of the prompts are simple, such as "Identify the values you grew up with, the values you accumulated during your life, and the values you have today." Some of the prompts are a little more difficult, such as, "Think about your life then sum it up in two or three sentences." My WHOLE life?? All 46 years in three sentences?? The second thing about this book that I really liked, is Dr. Temes' Clear Communication boxes at the end of the prompts. These instructional boxes help with writing and grammar issues, such as apostrophes, quotation marks , extra words and more. It's like an English Class reminder each day. So, I have not written my memoir yet. . .but with this book, I think it's entirely possible to pull one together in about a month. Even if it never gets published out int he big bad world, how amazing would something like that be for your kids to stumble upon years from now - or your grandkids. Through our writings and our memories, our life goes on for generations to come. Have you ever thought about writing a memoir? Disclosure - This post contains an affiliate link. I received a copy of the book to facilitate this review, however, as always all opinions are my very own.